The picture above is one my daughter took after cutting out the error to show me. 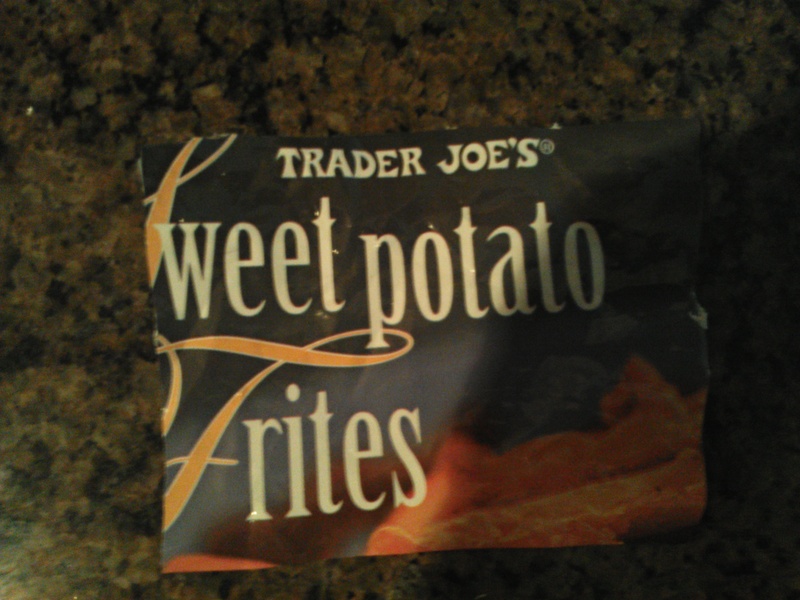 I’m not sure what frites are but sweet potato fries were in the packaging. Errors do happen, but seeing this one makes me think about the processes that allowed this to happen. There was artwork that was created for the printing. Then the printing tooling. In production, the operator had to place the tooling on the press and in most printing processes there are audits and checks. Then the bags were filled with fries, sealed and shipped. Employees at the Trader Joe’s stores had to take the bags out of boxes and put into the freezer in the store. That is the long way to say there were a lot of people that had to touch this process as someone adding value or as an inspection and this wasn’t caught. I wonder how many bags got sent to stores and bought by customers? I wonder if it has been caught and changed? I wonder what in the process allowed this not to be discovered? If you are a male like me you may hate shaving as much as I did. I saw it as a chore. Something that had to be done because I didn’t want a huge ZZ Top beard. Because I didn’t want to do it, I took the short cut. I used an electric razor and then used a multiple blade hand razor to get what was left. The results…lots of ingrown hairs, a super sensitive face that stung when any lotion was applied and bleeding through my neck area. Not cuts but blood seeping through almost like a scrap. A few weeks ago, my wife talked me into going into a shave specialty shop. I spent a good 30 minutes with the sales woman. She showed me their natural shaving products and then talked about the proper process for shaving. I learned that for most men, the multi-blade hand razors are still very irritating to the skin. The best are the old school single blade razors that you screw into the handle, not the cheap disposable kind. So what is the proper process for shaving? 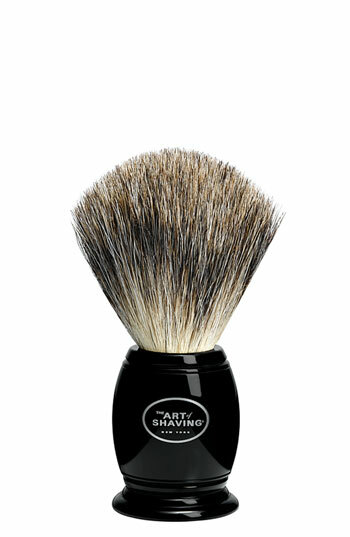 Apply shaving cream to a shaving brush in a small amount. I learned that badger hair is naturally anti-bacteria. Shave face going WITH the grain. Use short strokes and rinse. Shave face going AGAINST the grain. Use short strokes and rinse. My wife convinced me to give it a try, so I bought the brush and the oil, shaving cream and after shave balm. It has been a few weeks and I have to say the results are amazing. I get a much closer shave so I don’t have to shave as often. I have had zero ingrown hairs, my face is less sensitive and I don’t bleed when I shave. Too often we don’t want to follow the process because it seems long, over done or a pain, so we take short cuts. We may end up getting some good results once, but that won’t be repeatable. Take the problem solving process. We may short cut investigating the current state and what the problem truly is. One time we may get a good solution in place, but other times it is patchy results at best. As tedious as it may seem at times, we should always follow the process when we know it will give us good, sustainable results. In the lean world we always stress how important a good process is to achieving results. One of my favorite graphics I have seen is the one pictured below. It shows the four outcomes of balancing process and results. Having a Good Process and Getting Good Results is the gold star. We know we have a solid process that will give us the good results we want. Having a Good Process and Getting Bad Results is half way there. We know the process works like it should. It just doesn’t give us the results we want so we need to go back and redesign the process. 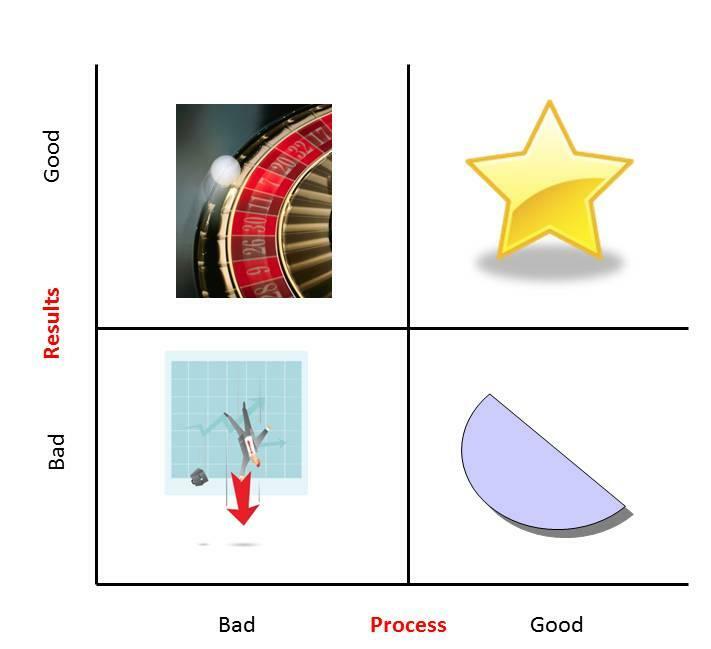 Having a Bad Process and Getting Good Results you are gambling. You got lucky to get the good results and it won’t be consistently repeatable. Having a Bad Process and Getting Bad Results is just not good. Nothing is working and you should start working on this right away. I am one of the first to stress process, but as you can see it must be balanced. When designing a process it must have the right mix of structure and flexibility because it is about understanding, learning and getting the results. For example, when designing a manufacturing process you may be more prescriptive because of the need to get a particular assembly done correctly. For a process around coaching or problem solving, there needs to be more flexibility. A determined process should be designed and used but it shouldn’t be as prescriptive as a manufacturing process. It allows for the person to be able to go where the problem is taking them but achieving the desired results is still extremely important. The need to balance the importance of a good process and the getting good results is a key skill to have when teaching people about lean. Sometimes you just wonder if people design processes in order to create waste. Like it is a hobby and creating all the waste is just fun for them. People I am close with recently had a death in the family. He was a veteran with illnesses from handling Agent Orange in Vietnam. He passed at the VA hospital. The family believes the unexpected complications that lead to his passing are related to his illness from handling the Agent Orange. The VA hospital asked the family if they would like to request an investigation and the family did. After close to 6 months, the family receives a letter stating the investigation is complete. If the family would like to see the results they need to submit a request for the results. Really?! How many people do you know that request an investigation into anything and don’t want to know the results? So the VA wants to create more paperwork and processing to send something the family requested months earlier. Again, the family originally requested it. Why wouldn’t the VA just send the results? As ridiculous as that sounds, that isn’t the biggest waste of this ordeal. A week later the family receives a letter stating they will receive the results via the mail within 2 weeks. What?! Why wouldn’t the VA just send the results? They have already set the expectation that it won’t happen quickly because the investigation didn’t. Someone has a job that is sending letters saying the information is being sent. I don’t know where to even begin with this. The family has been through enough. The VA should be making things easy on the family and not more frustrating. Quick simple solution. When the family requests an investigation have the results sent directly to them after the results have been finalized. No requests for sending the results. No letter saying the results are in the mail. Just send it. When you hear of something like this, you really have to wonder if anyone is paying attention to this process and how it got designed so poorly.